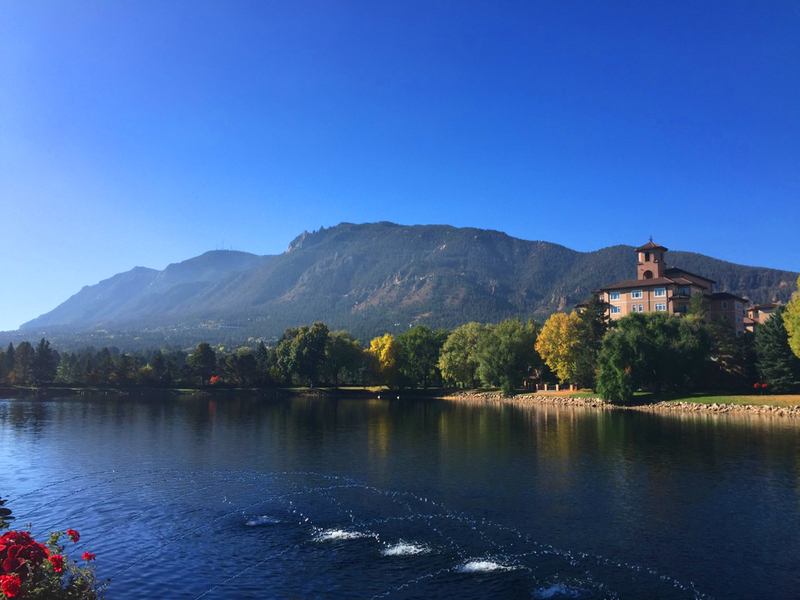 Nestled within the backdrop of the Cheyenne Mountains sits the stunning Broadmoor Resort in Colorado Springs. 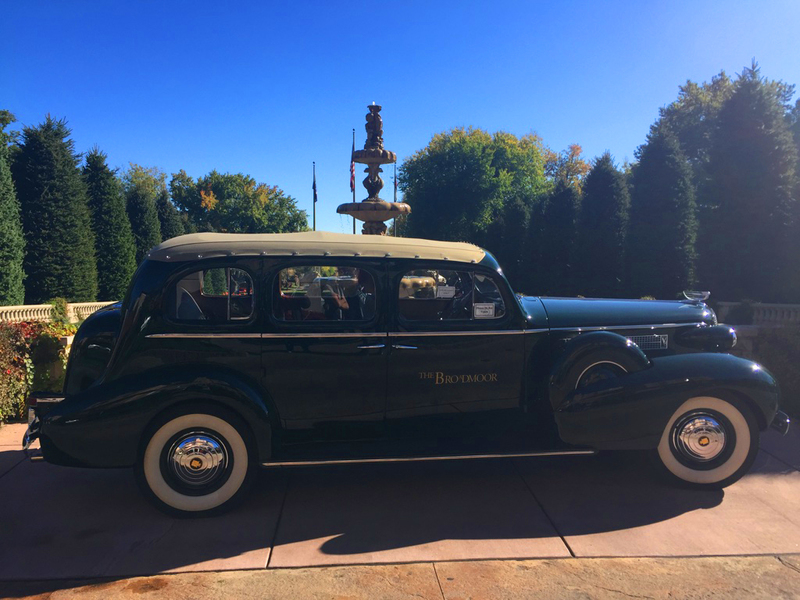 Boasting a history of nearly a hundred years, and a Five-Star rating for over half of that time, this resort is consistently voted one of the top hotels in the U.S.A. 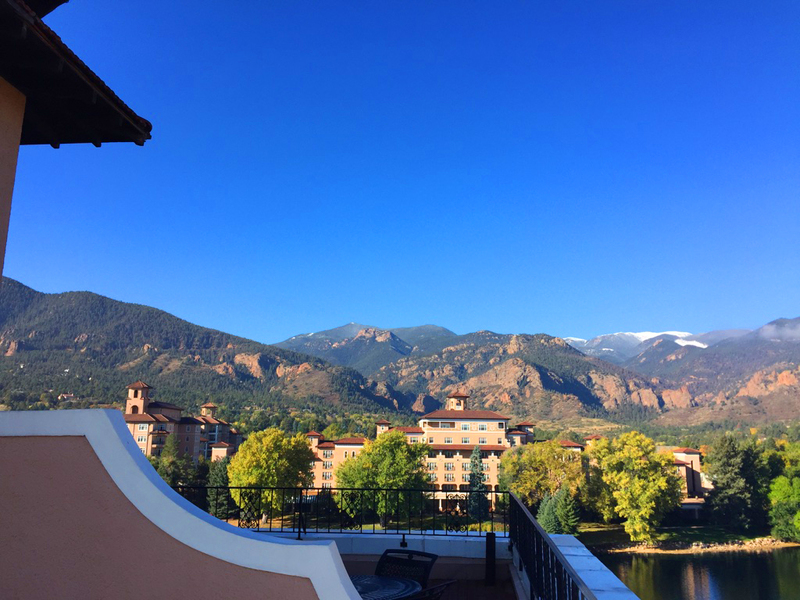 I was lucky enough to stay here during a recent trip to Colorado Springs (see here for a separate blog on that trip). On arrival, after being driven up the long, impressive driveway, there didn’t appear to be much to see as we arrived at night in the dark. A long day’s travelling from the U.K. to the U.S. meant that sleep was the only thing worth thinking about at this point. Waking the next morning proved different. 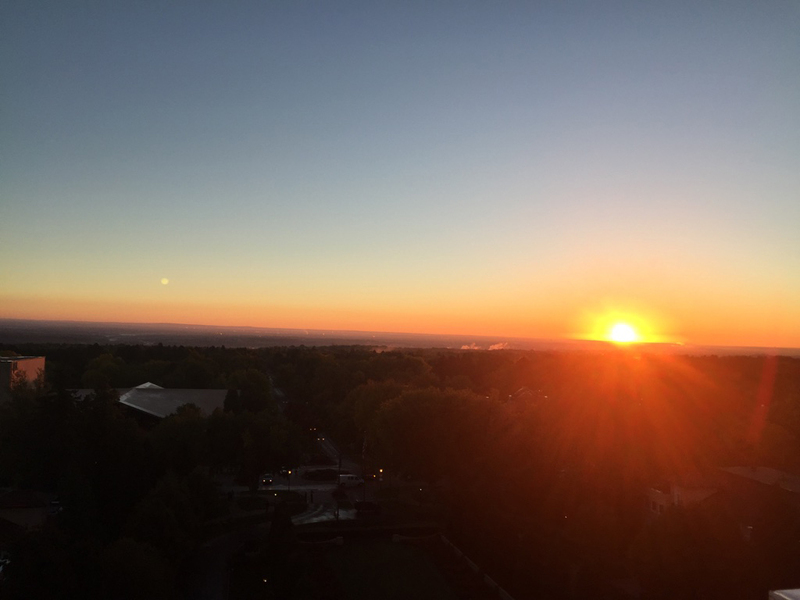 As I woke, I stepped out on to my balcony, looking to the front of the resort at the distant sunrise on the horizon. 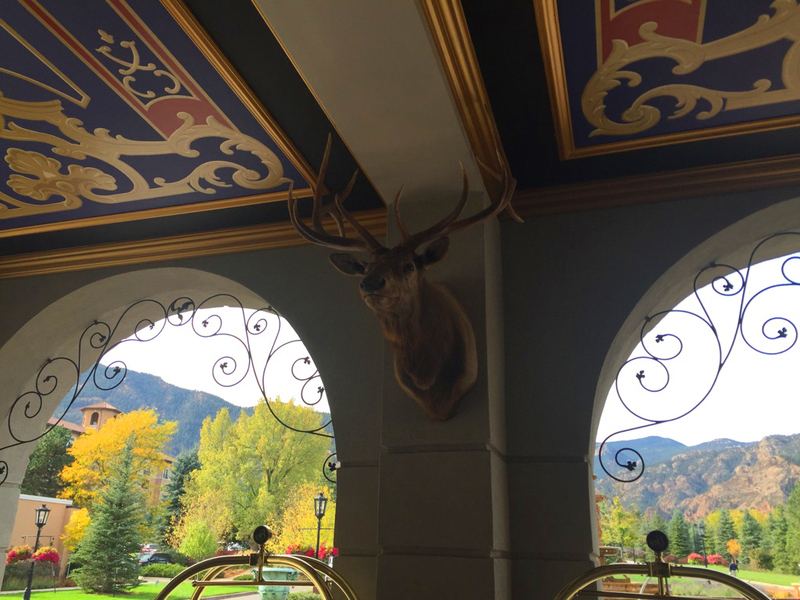 Turning 180 degrees, I had the view of the snow-capped Cheyenne Mountains which rose above the large Cheyenne Lake in the centre of the resort. Despite it being a cold October morning, I sat here with coffee to watch the sun come up. An impressive sight. 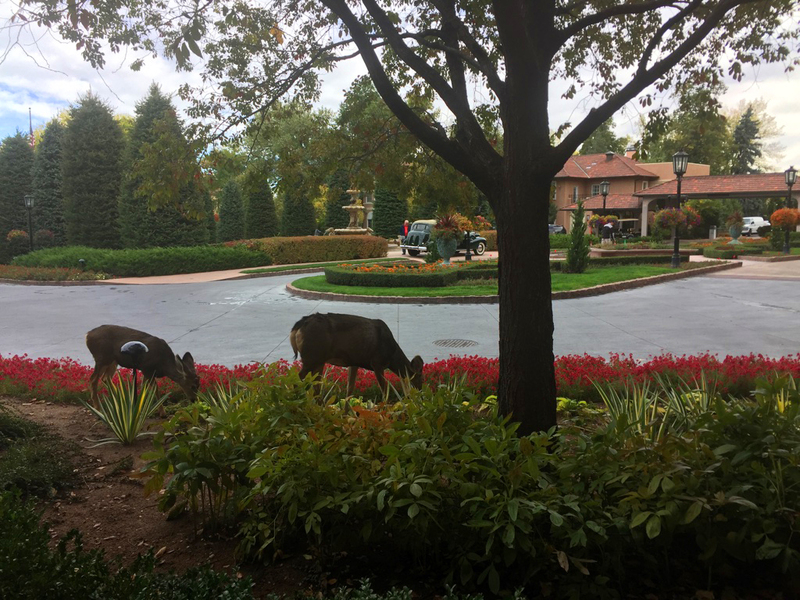 The large tree-lined driveway at the front of the resort boasted a large fountain, old-fashioned cars and wild deer that happily chomp (uninvitedly) on the bushes. 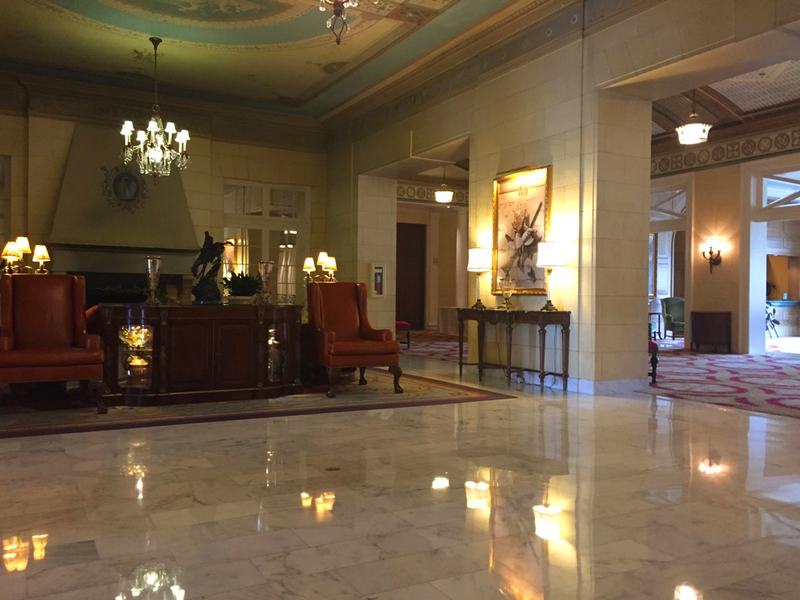 Inside the hotel, the wood-clad reception area is flanked by two large staircases which take you up to the marble floored lobby, complete with chandeliers and grand piano. The room I stayed in was of a classical design, with King-Size bed, large television, marble bathroom and evening turn-down services (which involves relaxing music being left on for your evening arrival). Within the resort, there are many dining options. 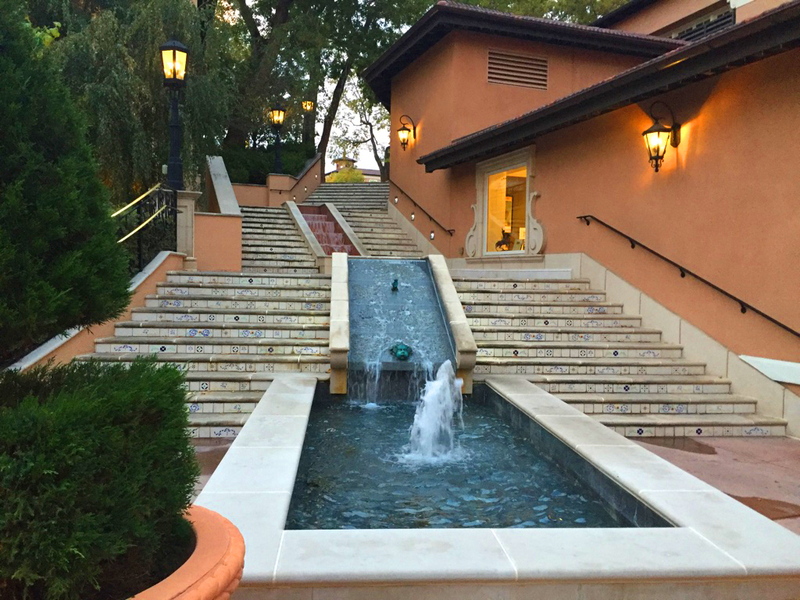 Breakfast was held in the Lake Terrace Dining Room and consisted of a buffet-style breakfast each morning. I also had a similar buffet in the Italian-style “Ristorante Del Lago” across the lake from the main hotel. We regularly visited “The Golden Bee,” a traditional English-style pub, featuring fish and chips, and ales. During service, the staff throw “bees” at you – these are small sticky-backed bees which stick to you when thrown. Finally, “Play” offered a more laid-back take on cuisine with an extended menu and supply of beers from local breweries. 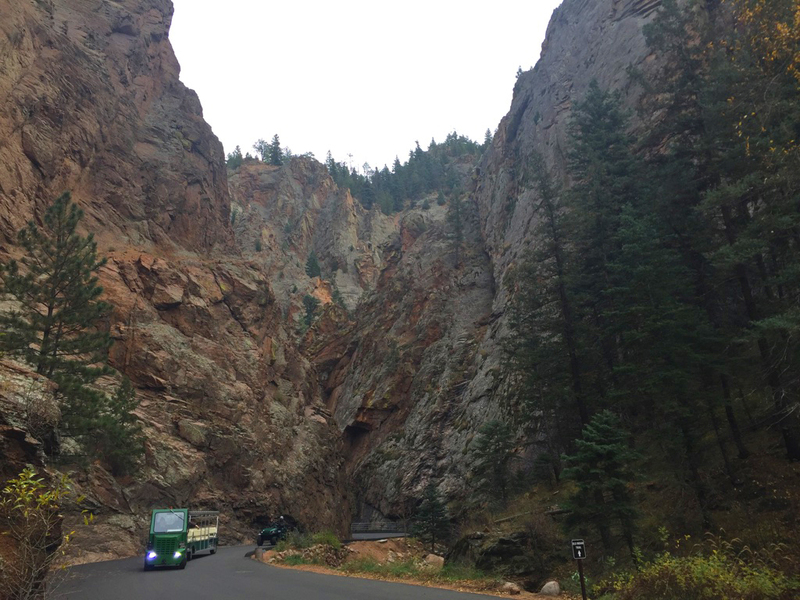 From the back entrance of the resort, it is possible to take a free shuttle less than one mile to Seven Falls. 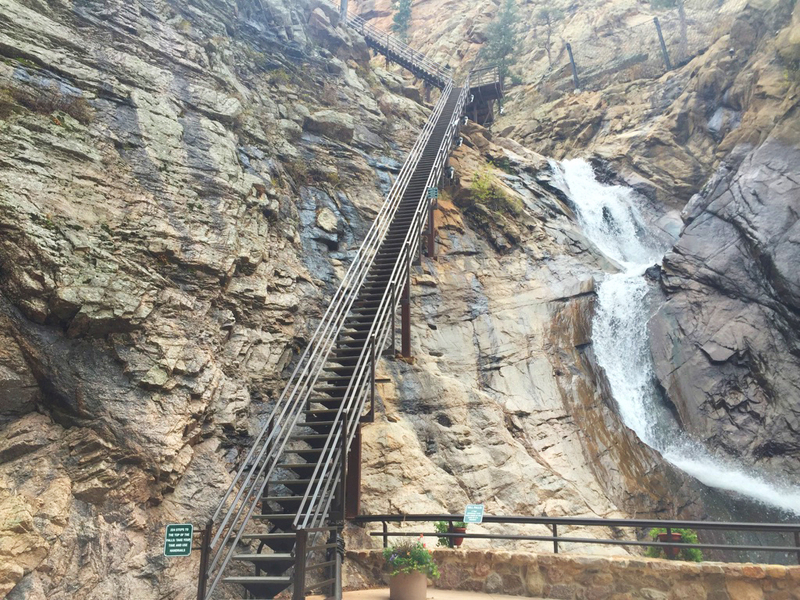 This is a series of waterfalls set within an impressive 1,250ft canyon and allows visitors to climb 224 steps for breathtaking views. There is also a restaurant, Restaurant 1858, located here. 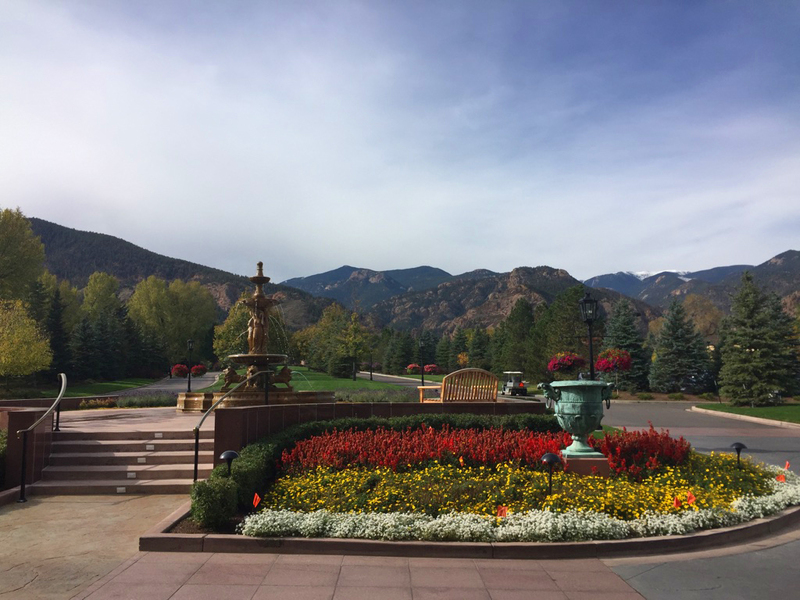 Also, within close proximity to the resort, visitors can choose to ride the Pikes Peak Cog Railway (a train ride up the famous Pikes Peak Mountain) or visit Soaring Adventures (offering activities such as zip-lining). 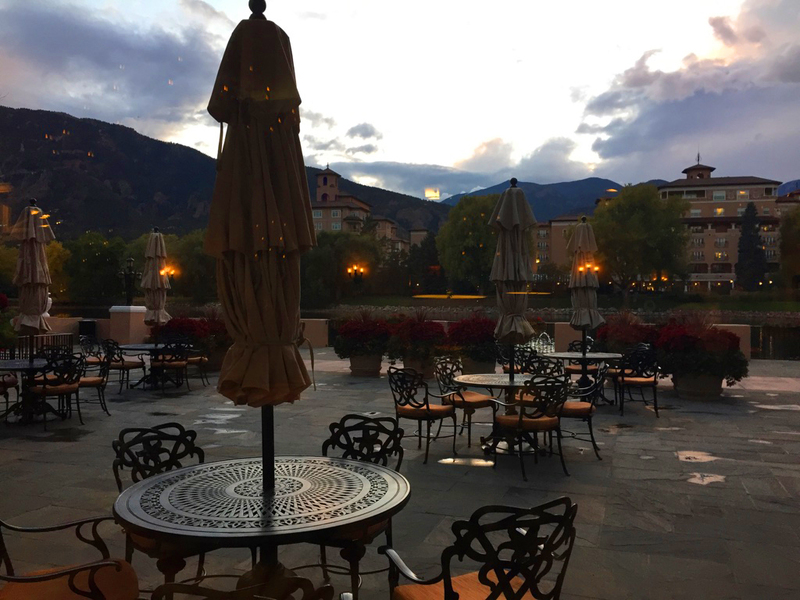 Needless to say I had a truly memorable experience staying at the Broadmoor. The resort offers a huge range of high quality shopping, dining and accommodation. 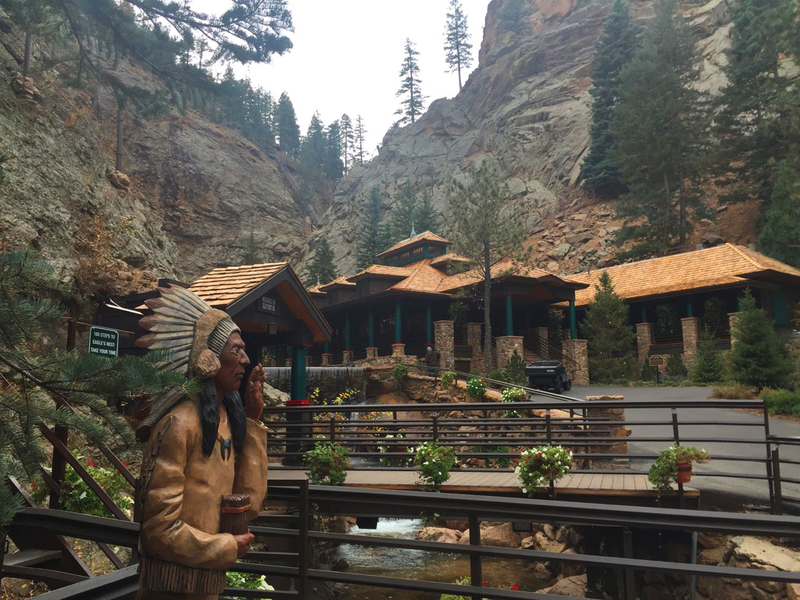 If you’re looking for somewhere to stay, perhaps for a special occasion, this resort certainly fits the bill. World-class accommodation however rooms a little old-fashioned in style for my taste. Huge range of amenities and extremely good service throughout.